The Sydney Morning Herald (Sydney of course) and The Age (Melbourne) in Australia had a story this past weekend (Saturday 9 December) about fake Aboriginal art. Well perhaps not fake, just not made in Australia. Buy a boomerang, a didgeridoo or some other Aboriginal artefact in Australia and it’s quite possibly made in Indonesia or China. Lonely Planet ran a story on this same trade earlier this year. ▲ I noted this in Indonesia a few years ago, walking along a street into Ubud – the highlands art capital of the island – I noted this local workshop turning out ‘authentic’ Australian Aboriginal boomerangs. As the story underlines there’s nothing illegal about selling Indonesian boomerangs in Australia, so long as you don’t claim they’re created by Aboriginal boomerang craftworkers. ▲ In fact what does come from where these days? Donald Trump, that well known US president, complains about all the German cars being sold in the USA when nobody elsewhere is buying good old American cars. But guess where those BMW X5 SUVs come from? They roll off BMW’s second biggest production line, at their Spartanburg plant at Greer in South Carolina, USA. Although if you opt for an armoured, high-security version that will be sent down to Mexico to be armour-plated at the BMW de México Toluca plant. ▲ If you want an all-American Chevrolet better head to Uzbekistan in Central Asia. As I noted when I drove through Central Asia earlier this year all the cars in Kyrgyzstan seemed to be ‘80s Audis, but in Uzbekistan they were all shiny new Chevies. Like this trio I spotted in Tashkent. Except perhaps they weren’t, they certainly rolled off the General Motors Uzbekistan plant in Asaka, in the extreme eastern corner of the country, but Uzbekistan Chevrolets are really Korean Daewoos with a Chevrolet badge slapped on the front. ▲ Or Boeing 787s, those all-American Dreamliners may roll off the Boeing assembly line at Everett in Washington, just north of Seattle. 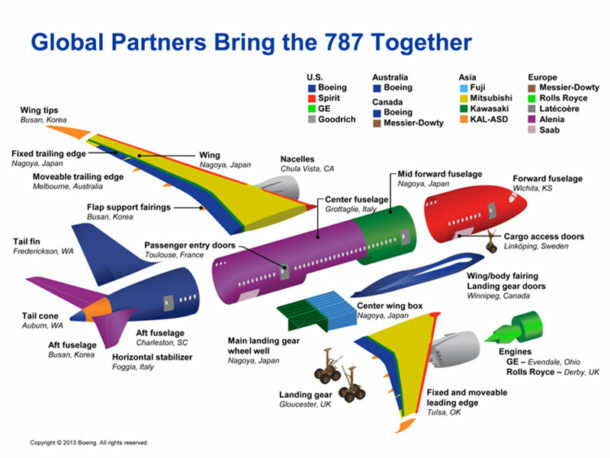 Although all the parts that go to make up a shiny new 787 are turned out all over the place, as this Boeing diagram explains. Including the wing ‘moveable trailing edges’ which are made in Melbourne, Australia, just a few km from where I am right now.